This book contains papers presented at the 9th International Congress on Molecular Plant-Microbe Interactions held in Amsterdam, Netherlands. 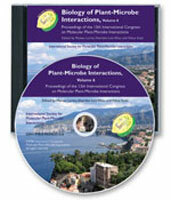 This book contains the papers presented at the 9th International Congress on Molecular Plant-Microbe Interactions held in Amsterdam, the Netherlands. Reports focused on interactions between plants and various "microbes" including viruses, beneficial and pathogenic bacteria, fungi, nematodes and insects. "New techniques are being developed for fast forward-genetics to identify additional genes required for virulence, avirulence, symbiosis, susceptibility and resistance. Many new components of signal transduction cascades have been identified by genetic tools. The research moves from molecular genetics into the direction of cell biology and biochemistry. Functional genomics and proteomics are becoming expanding research areas. These trends could be sensed during the congress...Significant advances were reported on mechanisms of disease resistance, signal transduction in plant development and plant defence, communication between plants and their associated beneficial and pathogenic microbes, mechanisms of virulence and avriulence, virus induced gene silencing and biocontrol agents. There were significant contributions on new research fields such as mycorrhizae, plant-nematode and plant-insect interactions." Development of Nematode-Induced Feeding Cells in Arabidopsis Roots: How Important is the Cell Cycle? Pathogen Pseudomonas syringae pv. phaseolicola: How Do They Work?